The Dhauladha Round trek is rare and remote on the lower trails the trek winds through acres of apple orchards, pine forests and over miles of green meadows. MAXIMUM ALTITUDE Indrahaar Pass 4350 Mts. & Minkiani Pass 4250 Mts. SEASON 15 May to 15th November. 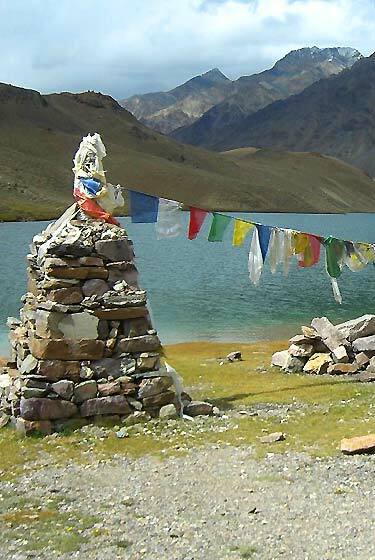 The Dhauladha Round trek is rare and remote - On the lower trails the trek winds through acres of apple orchards, pine forests and over miles of green meadows. Waterfalls are everywhere. Camp sites spring out next to streams and green grass. On the higher slopes, the trail weaves through snow fields, glaciers and ice falls. The thrill of high altitude is intoxicating. The trek goes through mixed forest of oak, rhododendron and deodar tress. First two Kilometer is a steep ascent but there is a gradual ascent after Galu Devi Temple. The last 1 kilometer is again a steep ascent through the forest. Triund is a flat meadow on top of a ridge. From here panoramic view of Dhauladhar range on one side and Kangra valley on other is a memorable sight. Night stay at tents or private houses. This is an acclimatization day. 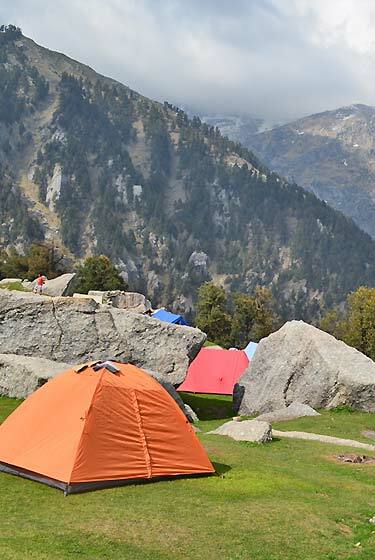 After a short ascent from Triund traverse a ridge to reach Laka Got a temporary shepherd camp. 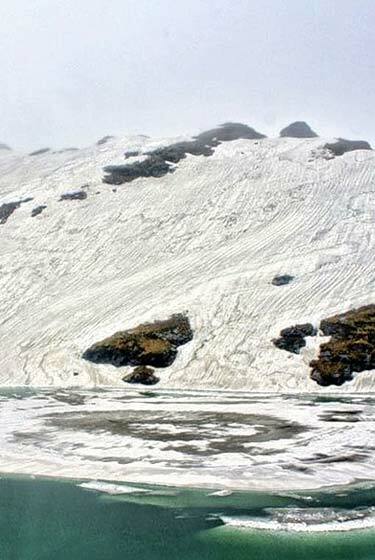 Laka Got is situated at the snout of small glacier, which is full of snow and ice in early summer, and the snow melt away during the monsoon. From Laka Got it is a sleep ascent for two km. Over rocky ridge to reach Lahesh Cave. Night stay in the cave of camp at Laka Got. The stretch up to chatta nullah is 6 km descent and crossing the strem walk over a long pasture land before into a thick forest of pines. Kuwarsi is a small tribal village surrounded by thickly wooded pine trees. Night stay in the village. the trek goes through thick forest and lush green fields. We came across many small places inhabited by Gaddi people.We reach road head side at Lamu from Lamu we take bus to Donali and little trek to Brahi 6 KM.O/N Camp at Brahi. It is 12 km trek from Drakund to Nagara Camp at Minkiani.Their is little shepherd hut at Nagara.O/N Camp at Nagara. It takes about 3-4 hours to reach the pass. Sudden weather change, blizzards and white out conditions are common phenomena at this pass. O/N Camp near by Kareri Lake. 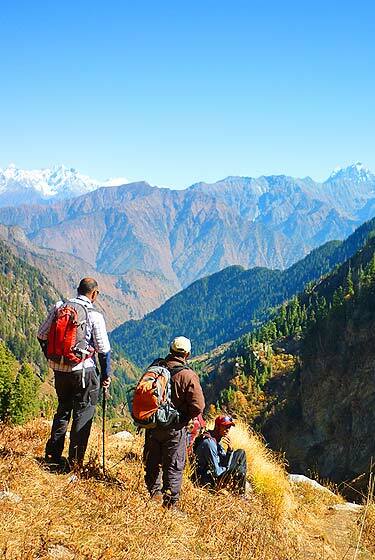 The trek goes steeply up to Kali Mandir or one can trek via Rohli which is a longer trek with mild ascents. 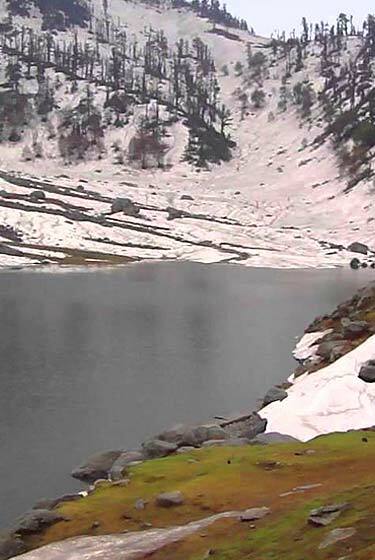 The trek goes all along Kareri Lake Nullah between a valley thickly wooded on both sides. 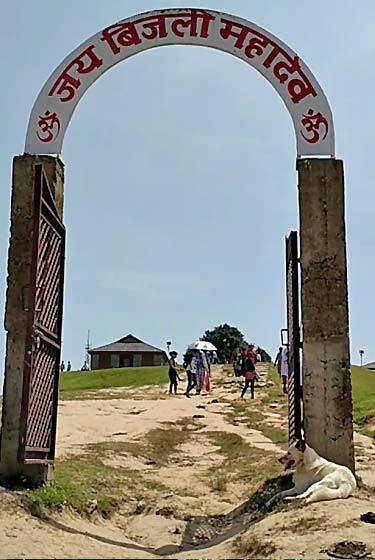 There is a Naag Mandir (Shiva temple) on the enterance of the dried lake.O/N Camp at Kareri Village. After B/fast we start trek to Ghera a little hydro project on road head side where we take company car to Mcleod Ganj or trek by Satowari Village to Mcleod Ganj. TREK END. Trekking Include with Dome Shape Tents/Sleeping Bags/Sleeping Mattress/Toilet Tents/sitting chairs etc. All vegetarian meals beginning with Pack Lunch on Day 01 to Lunch on Day 09. Professional mountain guide and mountain Instructor with English speaking. Company provide jeep from Ghera to Dharamsala drop on day last. Please keep in mind that the above information is not exact and does not account for sudden changes. Whatever the temperatures and conditions rest assured we will be prepared to handleit with ease as we use equipment of very high specifications.